Saudi stocks fell for the second session to close at 8573 points, losing 39 points, by 0.46 percent amid trading was the weakest a month ago, where it reached 2 billion riyals. The market value fell 8 billion riyals to 2.03 trillion riyals. The decline came mainly from banks, led by Al-Rajhi. While the "MT30" index performed worse than usual with a loss of 0.63 percent, losing seven points to close at 1265 riyals, which is showing the size of the decline, which was in the leading stocks, and improved overall index performance against the MT30 index that shows that SMEs were generally better off than leading companies. The banking sector is still putting pressure on the general index and if the performance of the "basic materials" led by SABIC. The wave of declines may extend to support levels 8500-8460 points, which is important to maintain in order not to lose the market gains since the beginning of the year. The results of the companies will play an important role in the market move, most of which have not yet emerged. The general index opened at 8612 points, trading between high and low. The highest point was at 8633 points with gains of 0.24 per cent. The lowest point was at 8558 points, losing 0.63 per cent. At the end of the session, the general index closed at 8,853 points, losing 39 points, or 0.46 percent. Liquidity declined 28 percent by about 809 million riyals to 2 billion riyals, and the average value of one transaction 25 thousand riyals. Traded shares fell 10 per cent by about 10 million shares to reach 91 million shares, and the turnover rate was 0.17 per cent. Deals fell 13 percent by about 13,000, to reach 84,000 deals. Eight sectors rose against the decline of the rest. The rise was led by "Investment and Finance" by 2.4%, followed by "property management and development" by 0.6 per cent, and "Media and Entertainment" by 0.33 per cent. The decline was led by "food segmentation" by 1.1 per cent, followed by "medicines" by 1 per cent, and "retail luxury goods" by 0.81 percent. The highest turnovers were "basic materials" by 29 percent with a value of SR 614 million, followed by "banks" by 23 per cent with a value of 484 million riyals, and "Capital goods" by 10% with a value of SR 203 million. 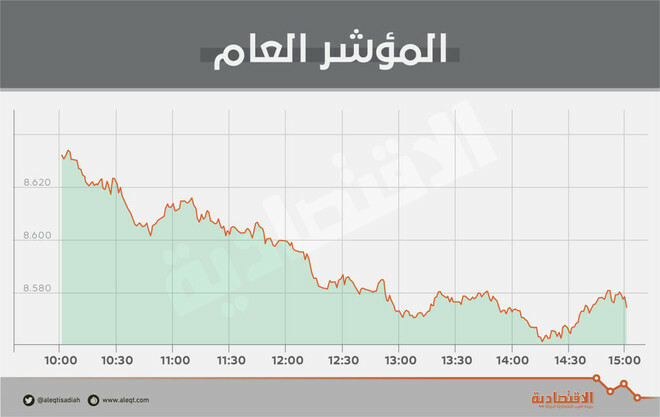 The rise was led by "Kingdom Holding" by 4.3% to close at SAR 8.97, followed by "Yamama Cement" by 3 per cent to close at 15.06 riyals, and "Qassim Cement" with a 3% closing at SAR 39.50. In contrast, the decline was led by "United Cooperative" by 3 per cent to close at SAR 12.50, followed by "Investment" by 2.2 per cent to close at 20.32 riyals, and "SAMBA" by 2.2% to close at 37.85 riyals. The highest turnovers were SABIC with a value of SAR 179 million, followed by "Al-Rajhi" with a value of 177 million riyals, and "Alinma" with a value of 130 million riyals.